It is a foggy Thursday morning here in Buellton, the fog will surely burn off soon to the heat. My family and I were away on our vacation before our daughter began school. Jerick was able to get sometime off from work and we were able to enjoy sometime together as a family. With that, I had to put my work on pause. 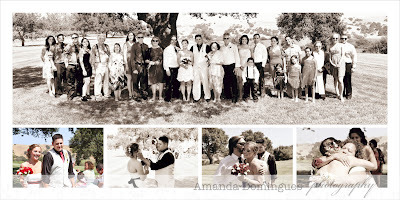 I wanted to post these images from Beth and Luis's wedding. Beth and Luis had a very sweet and intimate wedding ceremony at The Firestone Vineyard in Los Olivos. They were married on a warm and beautiful Saturday afternoon in mid June. Beth's best friend's husband happens to work with my husband. (There's always a fire connection somewhere :) ) They referred us to Beth and she contacted me about her wedding. 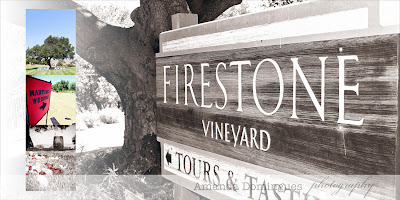 I was very honored that she contacted me, and I was excited about the opportunity to photograph at Firestone Vineyard. I drove over there to do some location scouting. What a beautiful location for a wedding!! Beautiful landscape draped in rolling hills of golden grass, coated in oak trees and lined with rows of bright green grape leaves, it's simply breathtaking. Beth and her best friend Molly had arrived and decorated the ceremony site, which was located underneath a huge oak tree in a grassy mesa over looking the hills and vineyard. Red, yellow and white rose petals were scattered along the aisle. Beth and Luis's immediate family arrived to share their wedding day with a few very close friends as well. Beth wore a sweet and summery short wedding dress adorned with a black and red ribbon around her waist with flowers pinned in her elegant hair. She wore sparkling jewelry (I just love sparkles) and rocked some killer red heels. I loved her red heels!! Luis looked calm and excited to marry his love of his life. Looking ever-so stylish in his red tie, black shirt and white vest and slacks. Beth's father walked her down the aisle, they were so sweet together. Their ceremony took place underneath the large oak tree. There was a wine barrel by the ceremony site with two wine glasses and a bottle of Firestone Sauvignon Blanc. They shared a glass together during their ceremony. Beth and Luis presented a rose to each other's mother's, a very sweet and endearing moment during their wedding ceremony. Beth and Luis wrote their own wedding vows to each other. I love weddings like this that have so many personal touches. After their first kiss and their stroll down the aisle together we gathered everyone up for photos. Then I proceeded with Beth and Luis's portraits. We went all around the vineyard. We took some portraits underneath the big oak tree, in the vineyard, around the gate to the tasting room and then down by the entrance to Firestone Vineyard. They had some playful props with them, a Giants flag as they are huge SF Giants fans, and a cute Thank You sign for their thank you cards later on. 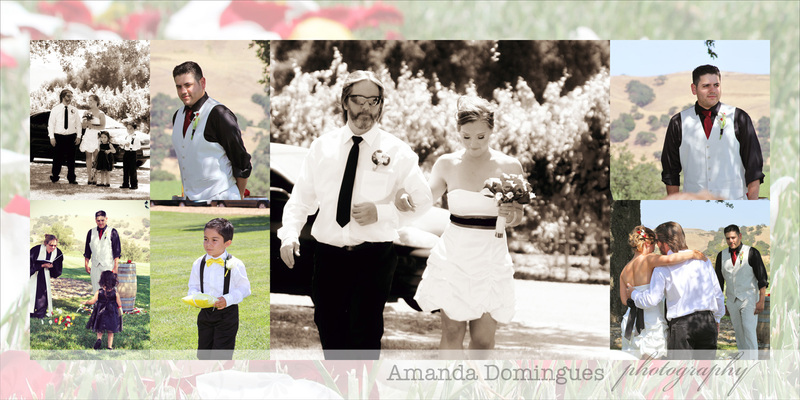 Their wedding reception was held at The Custom House in Avila Beach. I met them there and photographed a few hours of their reception. Beth and Luis are genuine and sweet and they were extremely easy to photograph. It was an honor being their photographer. I just love intimate weddings such as this, so many personal touches and so much love and support from their close family and friends. And the best part is they had the time to really visit with their guests during their wedding. They had asked for a petite wedding package of images and a slideshow. I designed this album for my studio copy and to leave one at Firestone Vineyard for promotion. 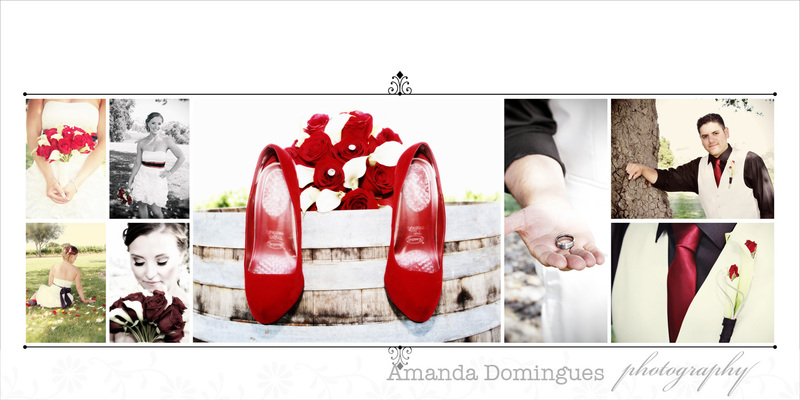 I wanted to share these images of Beth and Luis's beautiful and sweet wedding day. Enjoy! !